Up-Way Systems develops and markets Effisus Solutions. The Effisus solutions combine in an innovative and balanced way, Efficiency and Sustainability, promoting integrated systems with high added value and superior quality. Roof and facade integrated solutions for sealing, waterproofing, thermal and acoustic insulation that will generate superior building energy efficiency. 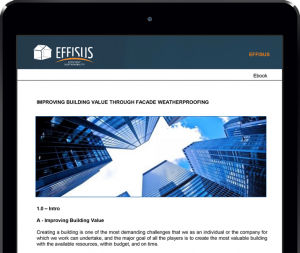 Effisus provides “Building Envelope” (water, air, heat, light and noise) solutions to maximize performance and lifetime of buildings. We offer a wide range of solutions and systems for roofs, facades, interiors and foundations, supported by our extensive consulting services. The result of such partnerships is the presence of Effisus in different continents, and its participation in globally renown projects, such as the Dublin International Airport, the Glasgow Arena in Scotland, the Orleans and Beauvais Hospitals in France and the Salalah Airport in Oman.